January 22, 2019 | Koh Phing Kan, Thailand - 'James Bond Island.' Scaramanga no longer occupies this secret lair, the tourists almost certainly scared him away. 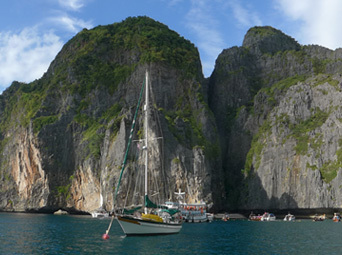 January 21, 2019 | Koh Hong, Thailand - Spot Dream Time anchored amongst the towering karsts of the Ao Phang-Nga Province. January 12, 2019 | Phi Phi Le, Thailand - 'The Beach.' Leo DiCaprio's not here, nor are the tourists - they've been banned! Mooring is allowed, so we stayed two nights. 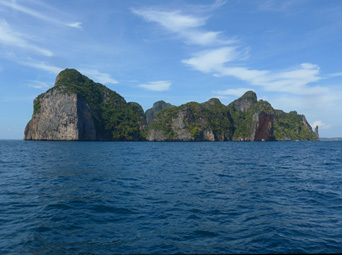 For over a week we've been happily meandering north across the Andaman Sea, sailing and anchoring amongst clusters of towering limestone islands, vertical cliffs that rise impressively from murky green waters into clear cerulean skies - rock faces so striking they demand attention and make you wish you were a mountain climber. Millions of years ago these lofty isles were coral reefs laying deep below the ocean's surface until shifting tectonic plates pushed them skyward, and over the ages driving monsoon rains, winds and seas have shaped these natural sculptures, smoothing rough edges, carving crevices and eroding softer rocks forming the shapes, sink holes, caves and hidden chambers that can be explored today. 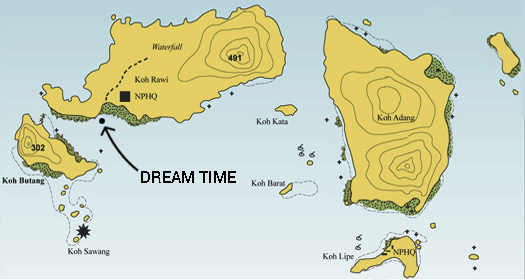 'Hong' is the Thai word for 'room' and within the craggy folds draped in jungle, these unique islands of the Andaman conceal dozens of them. 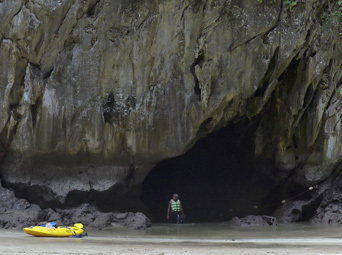 Many hongs are accessible only through watery caves near low tide. 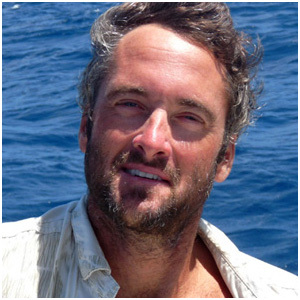 Some can be explored on a kayak while others can only be entered with a healthy lungful of air or a dive tank, along with a steady nerve and a reliable underwater flashlight. 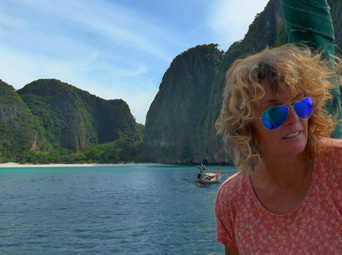 We visited the Emerald Cave, our first hong, in Koh Muk, which we chose to enter with new cruising friends, 'Thor', 'Viking Chick' and Gillie, only after the last tourist-carrying long tails had left the scene. Access to the hong is through a semi-submerged tunnel, a cave that burrows deep into the island where, if you time it correctly, tidal flows and a gentle heaving swell carry you through the darkness with a minimal of kicking or fuss. In sharp contrast to the pitch-black tunnel, which is over 200 feet in length, and the heavy echoing of sloshing seas against rocky walls, the inner entrance to the hong has new arrivals squinting in the sunlight and staggering onto the secret beach like giddy castaways. 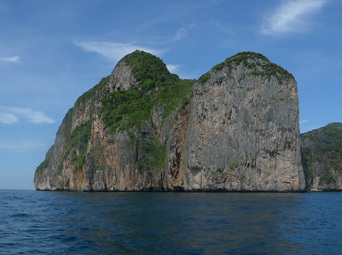 Hongs are varied in size and shape, but most of these enclosures inside the islands offer a hidden tidal beach and a little jungle garden contained at the base of a vertical wall of circular cliffs that rise hundreds of feet to a most satisfying window of sky and passing clouds above. Such is their popularity with tourists that unfortunately any serenity, seclusion or wonder that should be observed is drowned out by the sheer mass of humanity during the day. 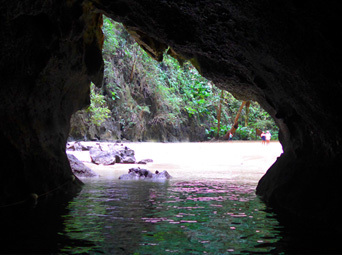 An earlier visit to the Emerald Cave during peak hours had me swimming with a hundred screaming newcomers through the cave and then offered standing room only on the tidal beach inside. The volume and density of shuffling human traffic could be compared to entering the New York subway at rush hour. 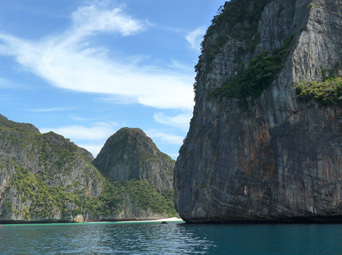 Movies such as James Bond - The Man With The Golden Gun and Leonardo DiCaprio's, The Beach, both with scenes shot at islands in the Andaman Sea, have only drawn more tourists to the region. 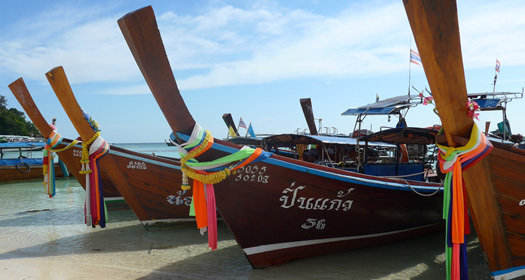 Phi Phi Le's Maya Bay, the location filmed in The Beach, sees up to 6,000 tourists a day during peak season. Such numbers cannot go unnoticed and these proud islands and delicate eco systems that have endured since before mankind was ever a concern, are quickly showing signs of distress. 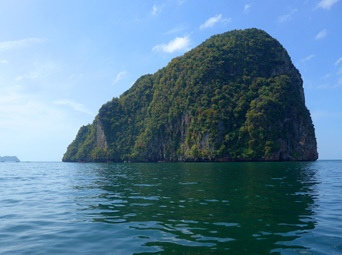 The volume of debris left by visitors and the damage to surrounding reef and coral systems have recently motivated local authorities to close shore access to both 'James Bond Island' and DiCaprio's beach on Phi Phi Le. But that hasn't stopped the tourists from coming, and who can blame them?! 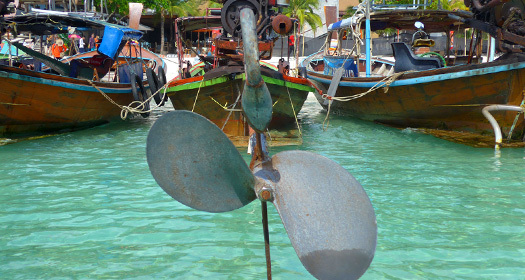 The islands and their hidden beaches are a wonder to behold, and during the day a steady flotilla of crafts enter Maya Bay - long tails, charter catamarans, motor yachts, dive boats - all just to get a glimpse of the paradise that is now forbidden. Recording the experience, for many, seemed more important than simply enjoying the reality of the moment, and we watched the parade of tourists struggle and compete for the best position in an attempt to capture the most perfectly manicured selfie. 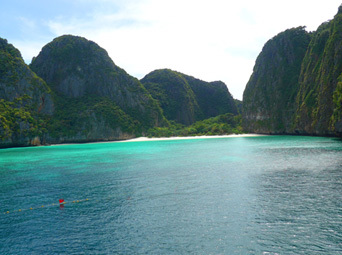 It could be argued that making the beach in Maya Bay forbidden has only increased its appeal, it has become a monument, symbolizing the idea of what paradise should be. After-all, nothing can compare to the perfection of our imagination, not even this reality, and certainly few selfies will live up to the expectations of their subjects. 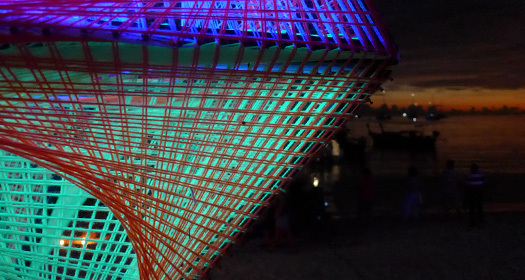 If allowed ashore the spell would be broken, the magic would inevitably disappear in the noise and within a few minutes, or perhaps a few hours, it would become 'just a busy beach' and then the next hong would be pursued. 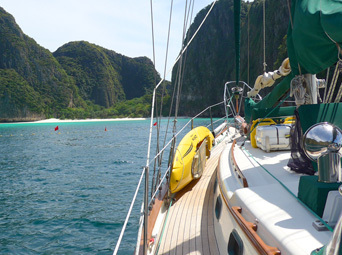 Dream Time spent a hectic day but two blissful nights moored right in the very center of Maya Bay. Daylight hours had us literally surrounded by a jostling pilgrimage of tourists. But in the evening, silhouetted by the setting sun, the last convoy of long tails puttered back to Phi Phi Don for happy hour, leaving us entirely alone, rewarded with a full canopy of stars in, ironically, one of the quietest, most sublime, restful anchorages we have experienced so far this year. 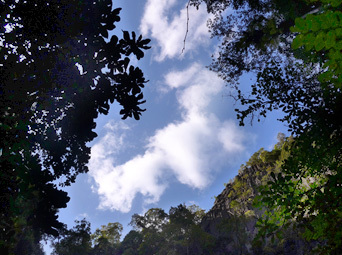 January 7, 2019 | Koh Muk, Thailand - Ready to explore our first hong (Thai word for 'room') - Dream Time anchored near the entrance of the Emerald Cave. January 6, 2019 | Koh Kradan, Thailand - Silhouette of a longtail captain. 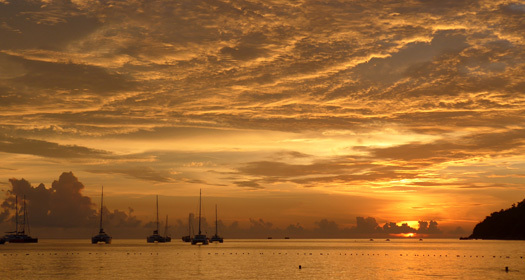 January 6, 2019 | Koh Kradan, Thailand - Calm restored on the Andaman Sea. 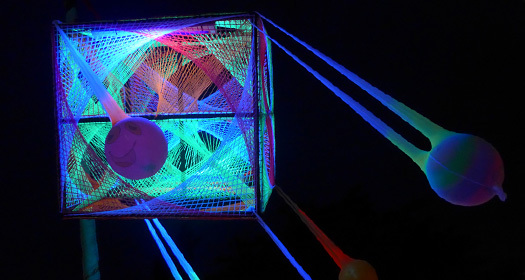 S/Y Tuppenny dropping the hook after some smooth sailing. 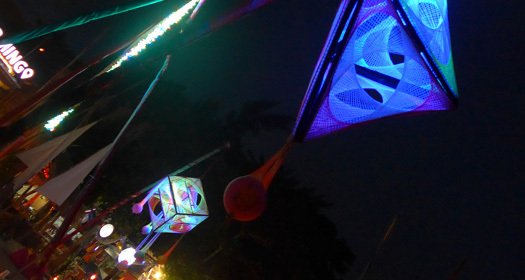 January 5, 2019 | Koh Rawi, Thailand - Hatches are open! 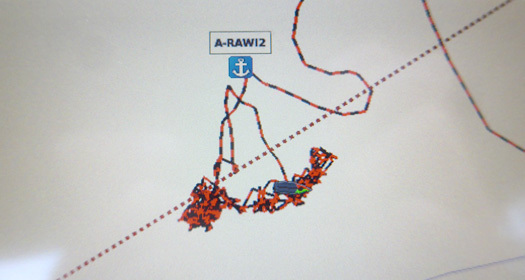 Pabuk, thankfully, shifted more to the north so our anchorage was spared. 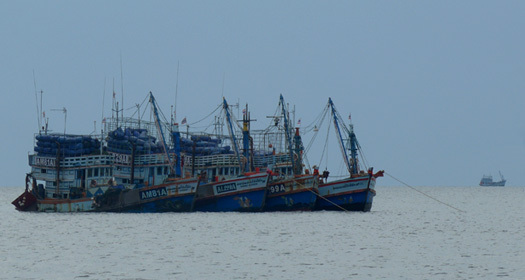 We've got every last link of our anchor chain in the water and from helicopter-carrying mega yachts, tall ships, tiny sailing boats to local fishing trawlers, we're all huddled together in a tiny corner of the Butang Group ready for the storm. 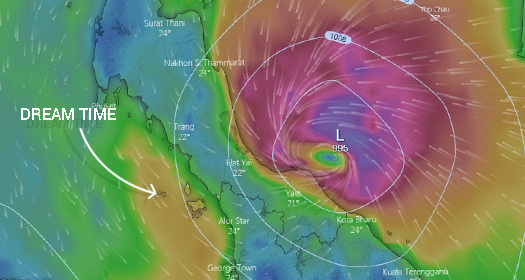 Pabuk (which translates to 'giant catfish' in Lao) is bearing down on us, and it's reportedly the earliest tropical storm to hit southern Thailand in 56 years. 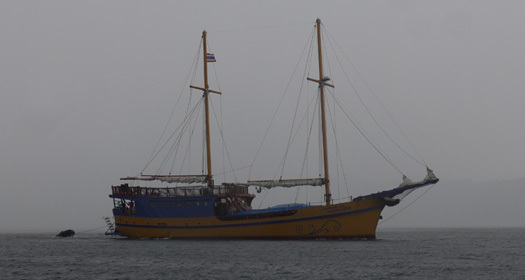 She's currently ravaging the Gulf of Thailand with 60 knot winds and 20 foot seas and is forecast to cross into the Andaman Sea tomorrow. 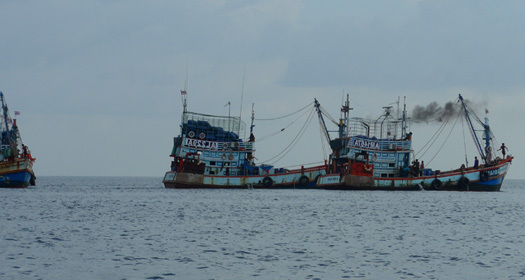 All-weather anchorages here are scarce, so we have to make the most of what we've got, which is not great. 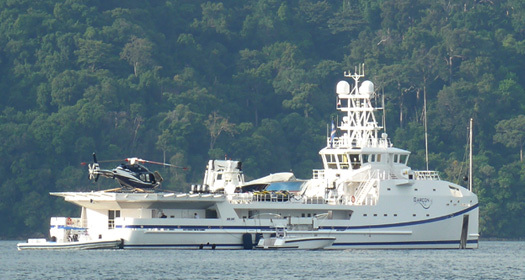 We're anchored in 90 feet of water so we've barely a 3:1 scope (a 10:1 scope is more suitable for 40-50 knot winds). 10,000 tourists have been evacuated but for all of us anchored here, we gotta ride this one out. If things get too messy our only other option is to bare-pole it down to Malaysia. January 3, 2019 | Koh Rawi, Thailand - Enjoying the calm. Tropical storm Pabuk will be arriving tomorrow. 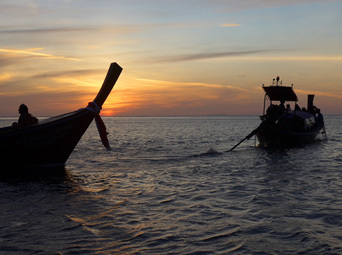 January 2, 2019 | The Legendary Longshafts of Thailand - Snorkelers and free divers beware. A New Country For The New Year! 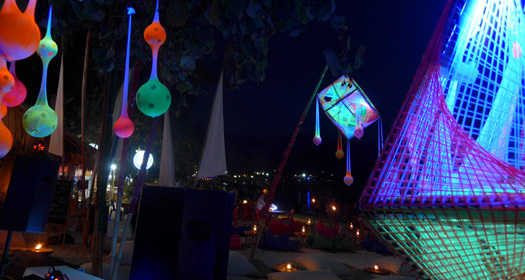 We celebrated New Year's Eve on a Thai beach under the psychedelic glow of groovy beach lanterns. 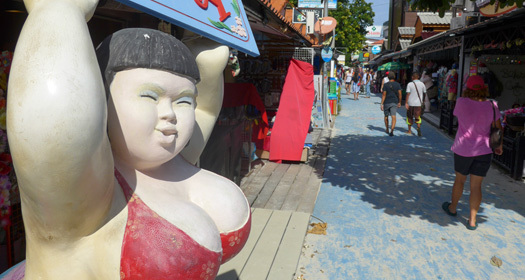 Koh Lipe, which rests on the most southern edge of Thailand's territorial waters in the Andaman Sea, is only 25 nautical miles north of Malaysia, but the two countries feel a world apart. Where the majority of tourists in Malaysia are from Asian and Indian territories, tourists here in Thailand, at least this corner of Thailand, are overwhelmingly of the sunburnt western variety. Jiggling buttocks in skimpy thong bikinis are ubiquitous (a rare sight in the Muslim majority Malaysia) and this morning I came across an Irish fellow happily swinging in a beach hammock smoking a big joint next to the National Park Headquarters. 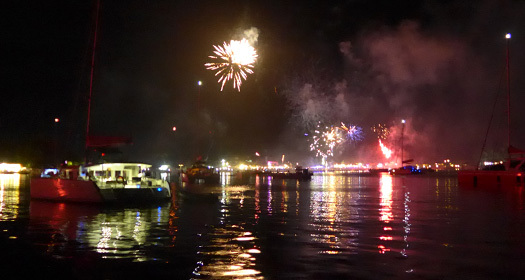 Indeed, it seems relaxed here and the New Year's Eve fireworks (which the locals stated were banned - something about local fishing boats being set ablaze) were spectacular, and lasted a full twenty minutes. Happy New Year!